Polaris UI Kit + Linecons Icon Set (AI, PDF, PNG, PSD, SVG). 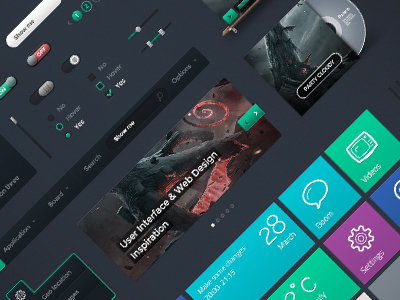 Polaris Free UI is a free UI Kit design resource made by Dribbble user Vladimir Kudinov. As far as I can tell, its license is Free for Commercial and Personal Purposes.